The 35th anniversary SuperCup NI event kicks off at Ballymena Showgrounds on Saturday when Northern Ireland and Wales Under-19 women’s team meet ahead of Manchester United and Northern Ireland’s U-18 clash at Coleraine. Ballymena receives the honour of getting the ball rolling on another week of exciting youth football with the first of two games at the Warden Street venue. The Ballymena games form a vital part of NI’s preparations for the upcoming UEFA European Championships in Northern Ireland. Northern Ireland’s Women’s Under-19 Goalkeeping Coach, Damian McCorry, has been training with the squad for the last two years and believes this is their opportunity to show just how good they are on the international stage. Damian has worked with both the senior women’s team and the Under-19’s for next month’s Under-19 Championship. He said: “It’s an opportunity for our girls to go out and prove how good they are. To prove how good their clubs are. “They are representing their clubs, their families and it’s a fantastic opportunity for them all. “The girls have been training Monday, Wednesday, Friday and Sunday. 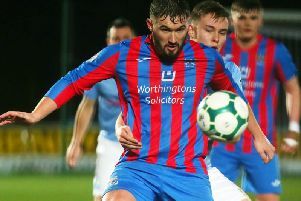 The finals take place 8-20 August with the group games being played in four venues across Northern Ireland: National Football Stadium at Windsor Park, Belfast; Mourneview Park, Lurgan; Ballymena Showgrounds and Shamrock Park. Kick-off at Ballymena on Saturday is 2.30pm with the return match on Monday at 12 noon. Later on Saturday afternoon Manchester United’s latest batch of rising stars roll out at Coleraine Showgrounds to face their U-18 Northern Ireland counterparts (5pm). The Old Trafford youngsters could give Real Madrid, Barcelona and Bayern Munich a run for their money, according to United’s under-18s coach, Fermanagh man, Kieran McKenna. The Reds enjoyed an entertaining first season under the former Tottenham youth coach who brings them to help launch the 35th SuperCupNI this weekend. McKenna and his young stars are just back from a training camp in Austria and expected to be among his squad is Glengormley teenager Ethan Galbraith who has happy memories of playing at Ballycastle Road. With McKenna at the helm now, the Under-18s scored at least three goals on 12 separate occasions on their way to a fourth-place league finish last season and senior manager Jose Mourinho clearly took notice. As well as giving Angel Gomes his first team debut, the Portuguese boss included Zak Dearnley in his matchday squad for the final league game of the season against Crystal Palace. “I think the standard of games is really high and we’ve had some terrific games this year,” he added.